The Dallas Stars assigned six players to the Texas Stars today: Justin Dowling, Radek Faksa, Julius Honka, John Klingberg, Curtis McKenzie and Brendan Ranford. The name that should stand out on that list is Julius Honka. The first round pick from this year's draft was expected to play in the WHL this season but instead will spend the year in Cedar Park. As recently as three days ago, it was expected that Texas fans would have to wait as long as a year more to see Honka at the Cedar Park Center. There are special rules for the AHL eligibility of players drafted from the Canadian major junior system. Those are covered in-depth in the Glossary. Honka appeared to have been drafted under these guidelines, as he was playing for the WHL's Swift Current last season. However, a re-interpretation of his assignment from JYP as a loan and not a permanent assignment made him eligible to head to the AHL this season. This considerably moves up his development timeline. It also puts a kink in the previous plans for the Texas Stars defense. OK, now what? Add Honka at the AHL and what happens? Of a group that includes Oleksiak, Meech, Gaunce, Klingberg, Fortunus and Jokipakka, who do you scratch so that Honka gets ice time? Otherwise, big camps for several others on this list. Dowling had his first NHL preseason action in his first year on a new contract with Dallas. Ranford did as well. Curtis McKenzie impressed and made a name for himself as a callup throughout the year. Klingberg and Faksa were expected assignments, but both had bright spots in the preseason that give good indication of their trajectory. Players who are expected with Texas that are still in Dallas include Travis Morin, Brett Ritchie, Jamie Oleksiak and Jussi Rynnas. The Texas Stars announced today their NHL parent club, the Dallas Stars, has reduced their training camp roster by six players. Justin Dowling, Radek Faksa, Julius Honka, John Klingberg, Curtis McKenzie and Brendan Ranford will join the Texas Stars training camp in Cedar Park. Honka (HAHN-kuh) is the only member from the group that did not skate with last year’s Texas Stars squad that won the 2014 Calder Cup championship. The 19-year-old defenseman was the 14th overall pick in this year’s NHL Entry Draft for Dallas. McKenzie was awarded the Dudley “Red” Garrett award last season as the AHL’s Rookie of the Year, scoring 65 points (27 goals, 38 assists) in 72 games. Faksa (RA-dehk FAWK-suh) was Dallas’ first-round pick (13th overall) in 2012. Dowling and Ranford each played significant roles for Texas in their championship run last season, and Klingberg tallied 28 points (11 goals, 17 assists) as a defenseman in 50 games last season in the Swedish Hockey League. Scott Glennie and Cameron Gaunce were also placed on waivers and will be assigned to Texas if they clear tomorrow. I've been a bit out of pocket over the past week. However, here's a catchup of the major events in the last week. The Stars prospects fell to the Columbus Blue Jackets last week in overtime of the final game at the Traverse City Tournament. It was a great showing by many on the squad, including Radek Faksa, Gemel Smith and Brendan Ranford. Those three are all expected to play for the Stars in Cedar Park this season. It was also a great showing for Derek Laxdal. It was not his first time coaching the tourney for Dallas though. He won with the 2008 squad. Good chance for him to get his feet wet though in the organization again. 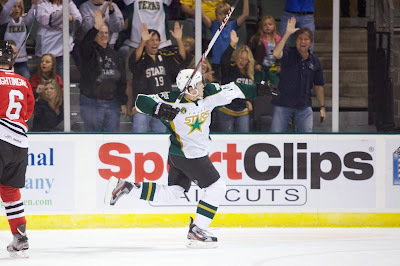 Kevin Henderson will be joining the Texas Stars again. Although he is property of Nashville, the Predators did not invite him to NHL camp. Regardless of whatever turned sour in Milwaukee for Henderson, the Stars found his presence a huge boon in the post season. He had 6 points in 21 games on the "Czech"-ing line with Radek Faksa and Matej Stransky. Dallas camp began in Fort Worth on Friday, bringing with it a huge outpouring of 'hockey's back!' excitement. While many Dallas players had nearly five months off from hockey, the Texas players in camp were working on just three months' rest. McKenzie and Morin combined for a tally in the game. Morin assisted McKenzie's third period goal off the rush. McKenzie led the Stars with four shots on goal. Regarding McKenzie, Lindy Ruff told the media after the game, "I just think he does a lot of good things inside the game. He does the little things right, and it starts there. He’s got a good goal-scoring touch, he’s got a physical side to him, so there’s a lot to like about the way he plays and way he carries himself on the ice." Further, Ruff had good things to say about Jamie Oleksiak's game: "I thought he kept the game in front of him. His gap was good for a defenseman. He made quick, smart plays with the puck; he didn’t try to chase the game at all; he stepped up physically for us when someone got close to our goaltender, or bumped into our goaltender, which was great to see. So his overall game was good for us." Despite losing captain Brett Ritchie to injury in game 2 of the tournament, the Dallas Stars prospects have cruised to a 3-0 record at the Traverse City tournament. They will play a team to be determined tomorrow evening at 6PM for the championship. Dallas has been buoyed by the Calder Cup playoff experience of their veteran players. Brendan Ranford, Radek Faksa, Matej Stransky and Brett Ritchie have all been big players in the tourney. Gemel Smith, expected to be with Texas this season, has a goal and four assists in three games to this point. Future Texas Star Jason Dickinson has two goals and an assist. You can see the leading scorer list, which is peppered with Stars, here. Derek Laxdal's first chance to get a look at many of his incoming players against another squad comes today as the Traverse City Tournament begins. The Dallas Stars' prospects will take on prospects from the Eastern Conference champion New York Rangers today at 6:00 PM Central. Dallas will play just four total games in the quick tournament with the final game being played on Tuesday. The Stars will face Carolina tomorrow and Buffalo on Monday. The last game will be played against an opponent to be determined by the results of the first three games. Dallas is in the Ted Lindsay Division and they will play their equally seeded counterpart in the Gordie Howe Division on Tuesday. The 1st v. 1st matchup is considered the championship. You can follow the action through Mark Stepneski (@StarsInsideEdge), who is at the tournament, or via the tournament's PointStreak page. Here's the schedule and here's Dallas' roster for the game. The AHL's schedule release was the last big news of the summer before the whole thing gets started again. Let's take a look at the timeline for the rest of the offseason, leading up to Texas's first home game on October 11th. Texas Stars head coach Derek Laxdal's first coaching experience with his new organization will be the Traverse City Prospects Tournament. Hosted by the Red Wings each year in the northern Michigan town of Traverse City, the tourney features the prospects of eight different NHL teams. Those tend to be the younger prospects. Think Brendan Ranford and Philippe Desrosiers but not Brett Ritchie or Curtis McKenzie. The full roster and schedule has been posted already. It's good to see the team succeed in this tourney, but I wouldn't peg too much to winning it. It's mostly a chance for team front office guys to get a look at what they have in some of the younger players and how they work together. It is also Derek Laxdal's first look at a lot of these players who will end up on his roster either this year or soon in the future. Dallas Stars camp returns to Fort Worth this year for the second year under the leadership of Jim Nill and Lindy Ruff. 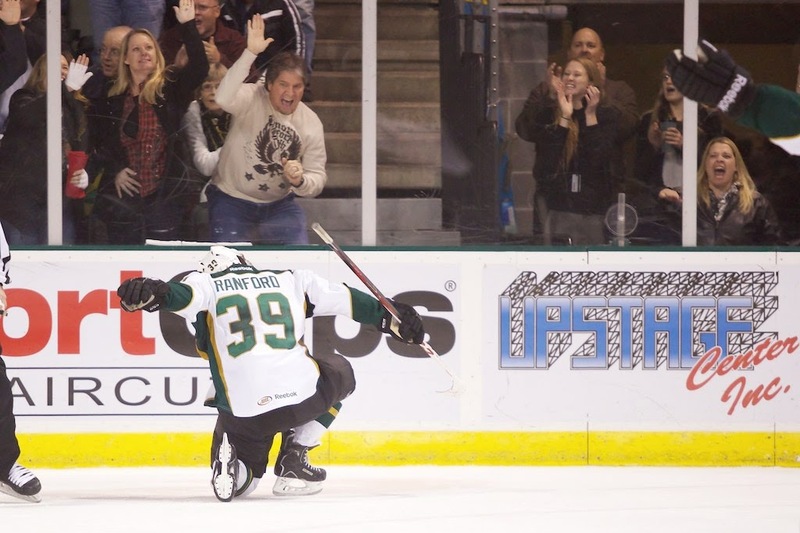 There are going to be a lot of names familiar to Texas Stars fans fighting for roster spots. Some of them are pretty locked into a place in Dallas, it's just a question of which line. One example is Colton Sceviour, who has been rumored as a potential top six forward with Jason Spezza as his center. Others will be fighting for a chance in the lineup at all, such as Curtis McKenzie, Brett Ritchie, Cameron Gaunce and even Travis Morin. Another matchup to watch will be the battle for the backup role behind Kari Lehtonen. Jussi Rynnas and Anders Lindback are both on one-way deals and hoping to take the load off the top tender, Lehtonen. The loser of that battle will come to Cedar Park. 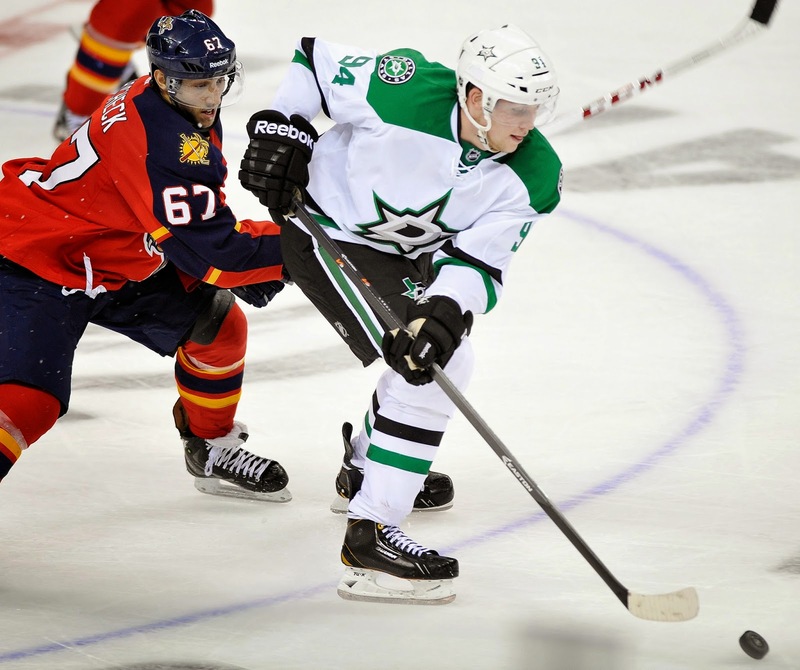 Dallas will play six preseason games, which should feature a lot of Texas Stars players. The first will be just two weeks from today, but they won't be broadcast in the Austin area. 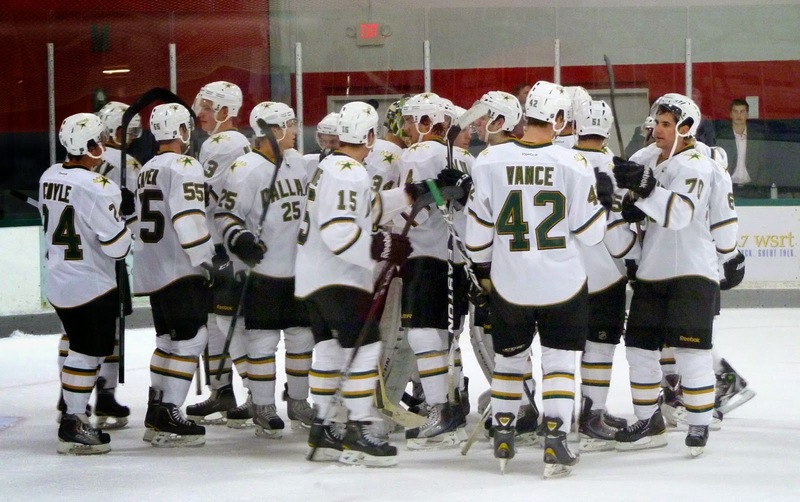 Dates are not set quite yet for the Texas Stars training camp. However, usually camp starts after a few preseason games have happened for the NHL side and some NHL contracted guys have been assigned. Dallas will bring their squad to Cedar Park to play a scrimmage on Saturday, October 4th. The format of the scrimmage has yet to be announced, but Jim Lites said around the announcement that the teams will be taking it seriously. Still, you can anticipate an All-Star game like atmosphere, as no one wants to get hurt in an exhibition game just before the season starts. Dallas opens a season full of expectations against a team that almost made it to the Stanley Cup Final last season, Chicago, on October 9th. Texas will raise their banners against the Iowa Wild two nights later on October 11th.